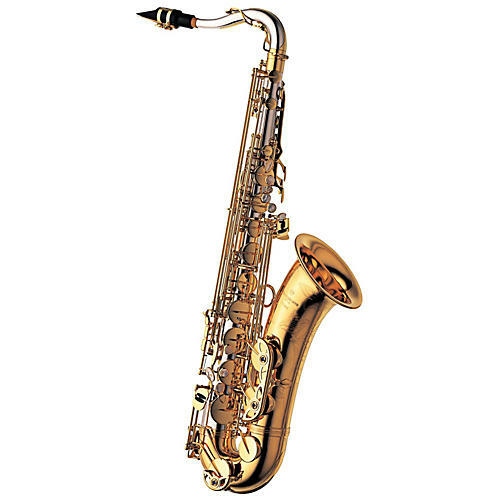 Yanagisawa saxophones are among the finest instruments in their price range. Feature by feature, with Yanagisawa, you always get more than you pay for. The T-992PG tenor saxophone's list of features is impressive for a horn this price. Both ends of the octave key axis rotate in a receptacle that is coated with teflon to insure a smooth operation every time. The C# and Bb keys have a rocking table mechanism that allows for optimal speed and fluidity between these pitches. Not only are the C# and Bb keys connected with the oscillating table mechanism, but the C# and B have also adopted this same motion. Insures a proper seal of the pads when playing in the low range of the saxophone. A player's fingers will rest comfortably in the indented white shell keys. The white shells also enhance the beauty of the instrument while also preventing the player's fingers from slipping during technical passages. Posts are connected to a single metal rib that is soldered to the body of the saxophone - this adds to the durability and longevity of the instrument. Both thumb rests on the saxophone are metal to match with the style of the saxophone and the right hand thumb hook is adjustable so that the performer can customize the feel of their saxophone. The pivot screws that are used have a pointed end which facilitates an accurate center and precise action. The pads are completely air-tight which supports stability in playing and their life is extended thanks to being waterproof. The metal resonators give clarity to the sound of the instrument in all dynamic ranges. Blue steel springs give the player quick response and are much more resilient than stainless steel (they also last much longer). Two separate arms connect to the pad cup to ensure proper seating of the pad and improve the durability of the instrument. The bell and the body of the saxophone are firm connected by a tri-point balanced bell brace. Order today and move into a great instrument.